Class photo at H.M.S. Gosling (March 1944 - June 1944) Dad is first row seated, 4th. left to right. HMS. Nabcatcher, RNAS Kai-Tak, (Monab VIII). Dad is front row kneeling, 2nd. left to right. 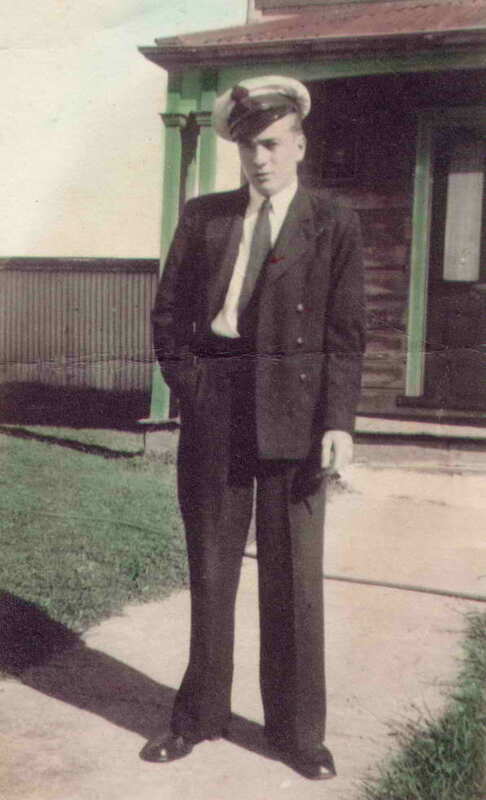 Taken between September and December 1945. HMS. Nabcatcher, RNAS. Kai-Tak, (Monab VIII). Dad is 1st. left to right. 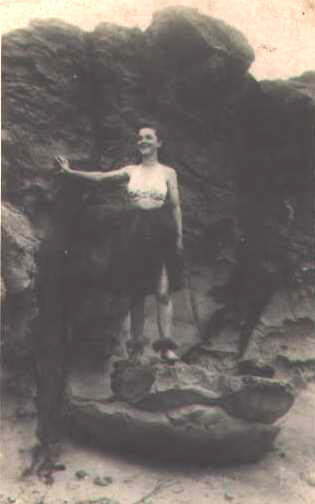 Taken between September and December 1945. 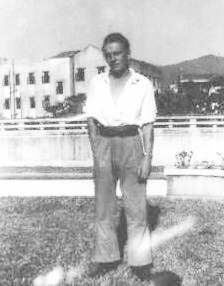 Dad outside 'Kowloon Flats' Hong Kong 1945. 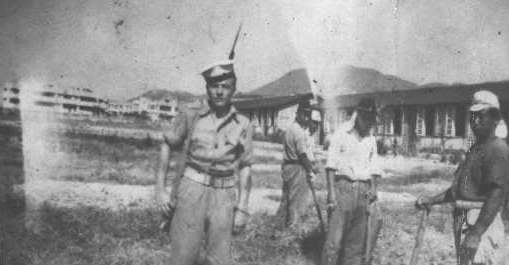 Dad with Japanese Navy P.O.W. 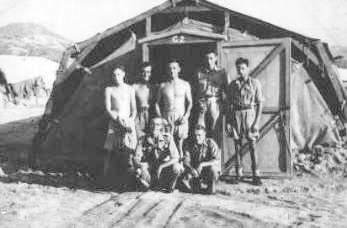 's inside No.2 Camp, (Sham Shui Po) Western Kowloon, Hong Kong in 1945. 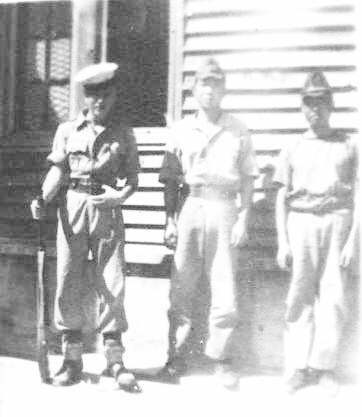 Dad with Japanese Navy Prisoners, outside No.2 P.O.W. 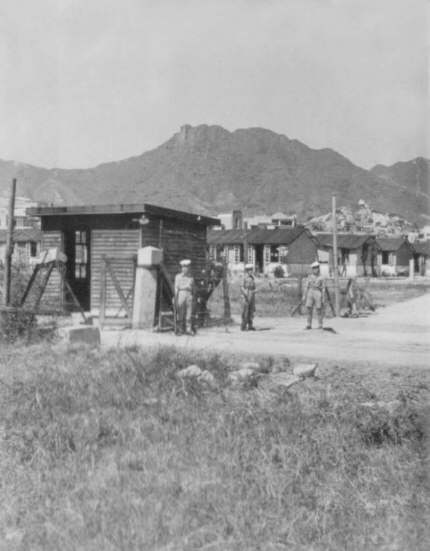 Camp Guard House, (Sham Shui Po) Western Kowloon, Hong Kong in 1945. Main Gate of No.2 P.O.W. Camp, (Sham Shui Po) Kowloon, Hong Kong in 1945. Dad is 2nd. left to right. 'Lion Rock' in background. Outside No.2 P.O.W. 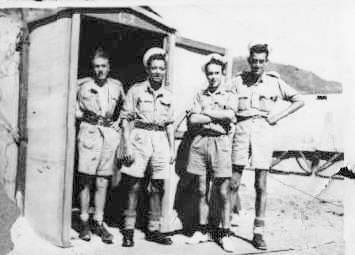 Camp Guard House, (Sham Shui Po) Kowloon, Hong Kong in 1945. Inside No.2 P.O.W. Camp, (Sham Shui Po) Kowloon, Hong Kong in 1945. Valerie, 'The Girlfriend' (not the one he married). Location unknown. 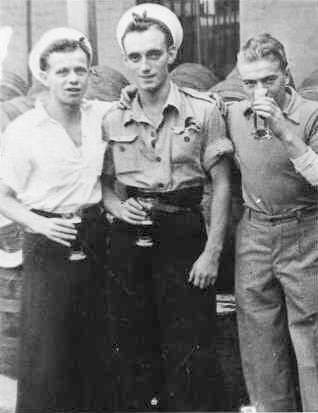 A mixture of No.1850 & No.812 Squadron personnel, taken at Victoria Barracks, Hong Kong in 1945. (Dad is in 1st row standing, 4th left to right, between Officer and Petty Officer). Back Row (l to r) ?, * Miller (812), C. Morgan (812), H. Orton (812), G. Wilkinson (1850), ?. 2nd Row Standing (l to r) ?, H. Smith (812), ?, ?, A. Fay (1850), ?. 1st Row Standing (l to r) ?, C. Broadbent (1850), E. Packer (1850), R. Davis (1850), H. Horton (812), ?. Sitting (l to r) E. Rayner (1850), S/L. ?, Lt. Boyle, P.O. Griffin (1850), E. Simonds (812). Front Squatting (l to r) * Charlton (1850), T. Murphy (812). Presumably in Australia, date and location not known. No. 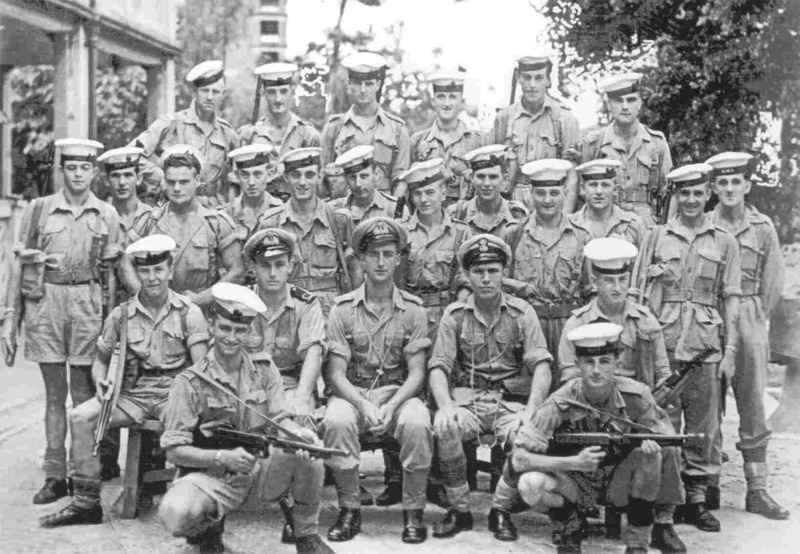 9 Squad group photo of No. 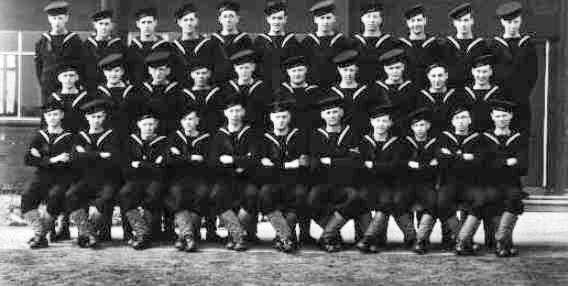 1850 Squadron at HMS. 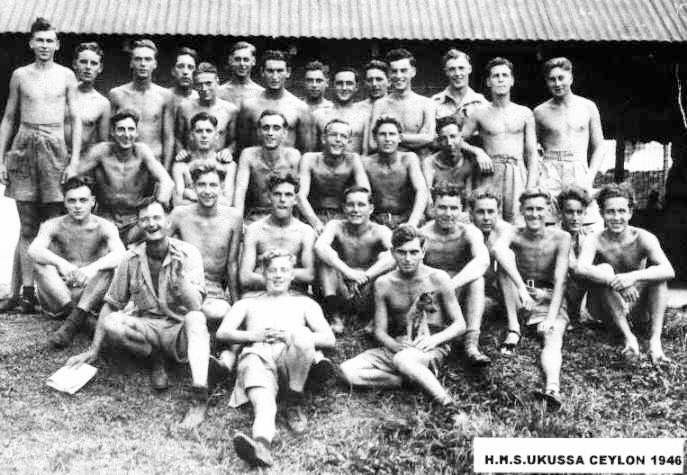 Ukussa, Katukurunda, Ceylon between April and June 1946. Dad is in 1st Row Standing, 4th. 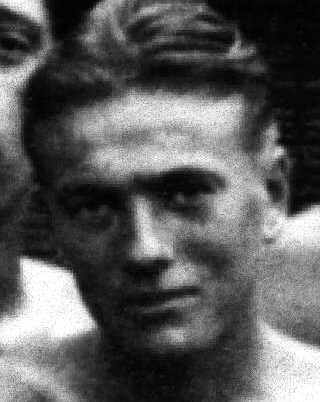 left to right (hands on shoulders of man in front). Back Row (l to r) ?, ?, ?, ?, ?. 1st Row Standing (l to r) ?, ?, L. Pratt, R. Davis, ?, H. Hoskins, P. Jackson, ?, ?. Seated on bench (l to r) ?, ? *, E. Packer*, ? *, ?, ?. Seated on Ground 2nd Row (l to r) ?, ?, ?, ?, ?, A. Garwood, ?, M. Mytton, 'Chopper' Barnes. Seated on Ground 1st Row (l to r) 'Pop' Ellison, ?, E. Miles & Dog 'Peggy'. (* Searching for).